Whilst experimenting with with encrypted partitions I wanted to shrink an "oversized" LUKS-encrypted partition. I was a bit astonished over the amount of steps required; in all the documentations I read some point was always missing. In addition I als stumbled over the mess of GiB and GB units used in different tools. Safety considerations taking into account the difference are important to avoid data loss. A big trap may be the fact that parted expects an end point on the disk given in GB when resizing. I nearly did it wrong. Otherwise the sequence of steps described below worked flawlessly in my case. I could reboot the resized root-system enclosed in the encrypted partition after having resized everything. I list up the necessary steps below in a rather brief form, only. I warn beginners: This is dangerous stuff and the risk for a full data loss not only in the partition you want to resize is very high. So, if you want to experiment yourself - MAKE A BACKUP of the whole disk first. Read carefully through the steps before you do anything. If you are unsure about what the commands mean and what consequences they have do some research on the Internet ahead of any practical steps. Likewise in case of trouble or error messages. You should in general be familiar with partitioning, LVM, dm-crypt and LUKS. I take no responsibility for any damage or data loss and cannot guarantee the applicability of the described steps in your situation - you have been warned. The partition had a size around 104 GiB before shrinking. The filesystem at the top included a bootable root filesystem of 80 GiB in size. The swap volume (2 GiB) helps to demonstrate that shrinking may lead to gaps between logical LVM volumes. We shall shrink the file system, its volume, the volume group and also the encrypted the partition in the end. In my case I could attach the disk in question to another computer where I performed the resizing operation. If you have just one computer available use a Live System from an USB stick or a DVD. [I recommend always to have a second small bootable installation available on the very same disk of your PC/laptop besides the main installation for daily work :-). This second installation can reside in an encrypted LVM volume (LUKS on LVM), too. It may support administration and save your life one day in case your main installation becomes broken. There you may also keep copies of the LUKS headers and keyfiles ...]. Resizing will be done by a sequence of 14 steps - following the disk layout in reverse order as shown above; i.e. we proceed with resizing from the filesystem to the LVM structure down to the partition. Otherwise you may not be able to close your device. 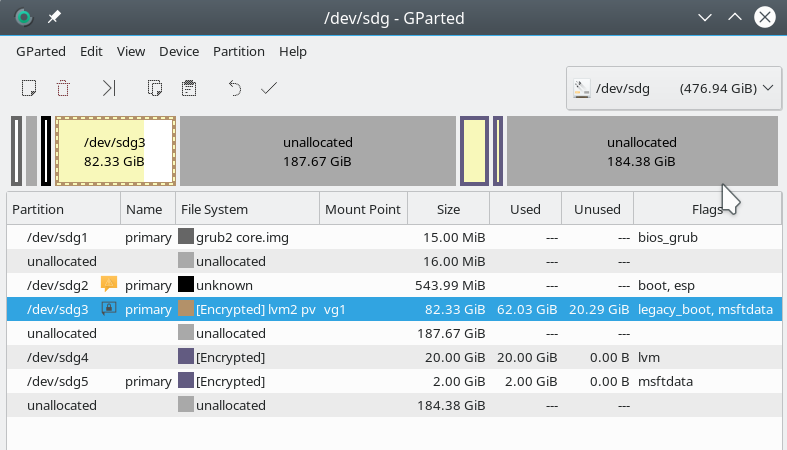 In my case the (external) disk appeared as "/dev/sdg" - the encrypted partition was located on "/dev/sdg3". Check that the mapping is done correctly by "la /dev/mapper" (la = alias for "ls -la"). Watch out not only for the "cr-ext"-device, but also for LVM-volumes inside the encrypted partition. They should appear automatically as distinct devices. "pvdisplay"/"vgdisplay" should show you a PV device "/dev/mapper/cr-ext" with volume group "vg1" (taking full size). If the volume groups are not displayed you may make it available by "vgchange --available y" (see the man pages). "lvdisplay" should show you the logical volumes consistently with the entries in "/dev/mapper". Note: "lvdisplay" actually shows the volumes as "/dev/vg1/lvroot", whereas the link in "/dev/mapper" includes the name of the volume group: "/dev/mapper/vg1-lvroot". In my case the original size of "lvroot" was 80 GiB and the size of the swap "lvswap" was 2 GiB. The filesystem should be clean. Otherwise run "fsck -f" - and answer the questions properly. "fsck" in write mode should be possible as we have not mounted the filesystem. We avoid doing so throughout the whole procedure. If you mount df -h may will show you less available space due to a 5% free limit set => 67G. So, not much space was occupied by my (Opensuse) test installation inside the volume. Make the filesystem size at least 10% smaller than the planned logical volume size! Why is this? There may be a difference for the meaning of "G" for the use of the resize commands: "resize2fs" and the "lvresize". It could be GB or GiB in either case. Have a look into the man pages. This difference is really dangerous! What would be the worst case that could happen? We resize the filesystem in GiB and the volume size in GB - then the volume size would be too small. So, let us assume that "lvresize" works with GB - then the 60G would correspond to 60 * 1024 * 1000 * 1000 Bytes = 6144000000 Bytes. Assume further that "resize2fs" works with GiB instead. Then we would get 54 * 1024 * 1024 * 1024 Bytes = 57982058496 Bytes. We would still have a reserve! We would potentially through away disk space; however, we shall compensate for it afterwards (see below). If you believe present man-pages: For "resize2fs" the "size" parameter can actually be given in units of "G" - but internally GiB are used. For "lvresize", however, the situation is unclear. In addition we have to check the potential reduction range against the already used space! In our case there is no problem (see step 5). However, how far could you maximally shrink if you needed to? Minimum-consideration: Give the 10 GiB used according to step 5 a good 34% on top. (We always want a free space of 25%). Multiply by a factor of 1.1 to account for potential GB-GiB differences => 15 GiB. This is a rough minimum limit for the minimum size of the filesystem. The logical volume size should again be larger by a factor of 1.1 at least => 16.5 GB. Having your minimum you think the other way round: You reduce the volume size by something between the 80 GiB and the 16.5 GiB. You set a number - let us say 60 GiB - and then you reduce the filesystem by a factor 0.9 more => 54 GB. Resizing the filesystem on /dev/mapper/vg1-lvroot to <pre style="padding:8px;"> (4k) blocks. The filesystem on /dev/mapper/vg1-lvroot is now 14155776 (4k) blocks long. WARNING: Reducing active logical volume to 60.00 GiB. Size of logical volume vg1/lvroot changed from 80.00 GiB (20480 extents) to 60.00 GiB (15360 extents). Logical volume vg1/lvroot successfully resized. Hey, we worked in GiB - good to know! Resizing the filesystem on /dev/mapper/vg1-lvroot to 15728640 (4k) blocks. The filesystem on /dev/mapper/vg1-lvroot is now 15728640 (4k) blocks long. Run gparted to get an overview over the present situation. "pvresize" works in GiB. We shrink the physical LVM area down to 80G. WARNING: /dev/mapper/cr-ext: Pretending size is 167772160 not 218034943 sectors. Again, we obviously worked in GiB - good. 185329702 blocks (rounded up) - this corresponds to around 88.4 G; according to our 10% safety rule this should be sufficient. Step 13: Reduce the size of the physical partition - a pretty scary step! But especially with parted you have to be extremely careful - parted expects an end position in GB. This means that to calculate the resulting size correctly you must care for the starting position - it is the difference that counts. Read the man pages and have a look into other resources. As you see: We end up with a size of 88.4 GB and NOT 89 GB !!! In addition we shall see in a second that the GB are NOT GiB here! So our safety factor is really important to get close to the aspired 80 GiB. /dev/mapper/cr-ext is active and is in use. We use "pvsize" again without any size parameter. The volume group will follow automatically. Our logical volumes are alive, too, and have the right size.